Theory meets technology. How does the Merus Ring work? The special thing about Merus is that no use of chemicals is necessary. This is ideal for water treatment as there are no side effects or environmental damage to be feared. 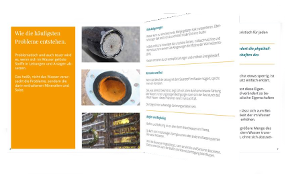 Nevertheless, we can effectively combat limescale, rust and biofilm in technical pipelines and systems. Instead of chemical processes, physics plays a major role. What at first sounds complicated is eventually simply explained. Water can carry a certain amount of foreign particles. 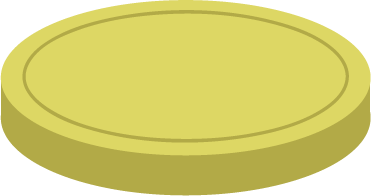 If this amount is exceeded these particles settle and can form a hard crust. One popular example for this is limescale. The reason for the behavior of the particles in water is among others how the atoms of water and limescale move or oscillate. The atoms move synchronously, this means that every single atom oscillates just like its neighbor. If the other oscillation is brought into the movement these two can overlay. This is called interference. Thus two different oscillations result in one new. If an oscillation is brought into the fluid specifically this is called active oscillation. To bring the oscillation into the fluid a carrier is needed which can maintain and transmit the oscillations. We have developed a ring which needs to be installed around the pipe. No direct contact with the fluid is needed. The oscillations can be transmitted into the fluid through the pipe. An illustrative example of this phenomenon is how music (acoustic waves) is transmitted through the air. You are able to hear the music coming from a loudspeaker without touching it. With sufficient volume, you even can hear it in an adjoining room, through the wall. Just the same as what the Merus Ring does - it transmits waves or oscillations to the fluid. The Merus Ring and its effect. Our Merus ring is made of aluminium, which is treated by us in a special process. Once placed around the water pipe, it transmits its active oscillation to the water. This increases the solubility of substances soluble in water, as explained above. Existing deposits are thus gradually removed. New foreign substances are also simply rinsed out. After some time the pipes and technical equipment are clean again. We also have something to counter corrosion and biofilm in the pipeline. 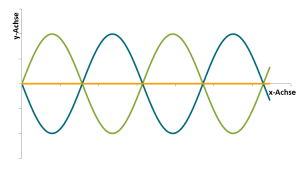 In this graph natural and active oscillation have the same frequency but opposing amplitudes. They are exactly superimposed and therefore cancel each other out. That is why the resulting oscillation lays on the x-axis. In this case natural and active oscillation tops and valleys are at the same time. This is why mutually reinforce each other. 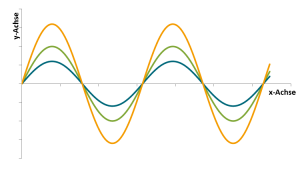 Thus the resulting oscillation has a higher top than the original oscillations. The two graphs are intended to show how superimpositions of oscillations work in theory. In practice, research on this topic is the basis of Merus technology. Which active oscillations are necessary to achieve the desired effect? How can we protect the Merus Ring against external influences? These are just a few of the questions we are constantly working on to achieve the best results. We have been doing water treatment for more than 20 years. In the past we have made our experiences with nearly every issue concerning fluids in industry and private homes. From the deserts to the cold north, from drinking water to crude oil, onshore and offshore - Merus Rings are doing excellent work in all areas. The theoretical background of the method is based on empirical experience, assumptions and conclusions we could make on many cases and projects. If you are interested, just use the offer of testing the effect in a trial phase. You are interested in learning more about cause and effect of the Merus technology? Have a look at our brochure. A short trip into physics gives an overview over the theoretical background behind Merus. Talking about costs and benefits means also talking about savings through the Merus Ring in production or at home. This means not only calculating costs for extensive cleaning without the Merus Ring but also costs for appliances, pipes and machines which can be protected through water treatment. Depending on the application there are different approaches to determine costs and benefits.